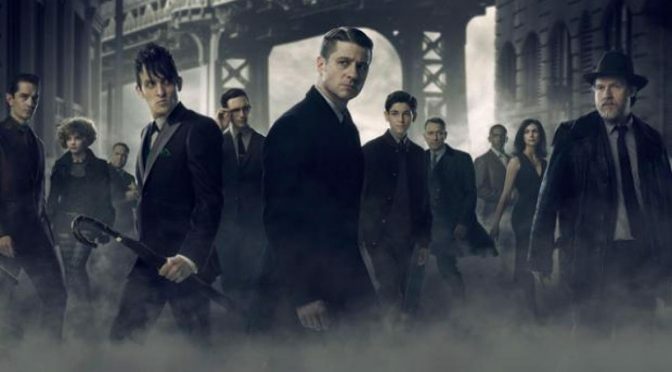 With several reliable sources on twitter and Instagram over the last couple of weeks, Gotham Season 4 will begin filming back at Steiner studios in Brooklyn New York on the 20th June 2017. Executive producer John Stephens posted on twitter the title of the first episode “Pax Penguina” which is written by himself and to be directed by executive producer Danny Cannon. As in true Gotham style the title doesn’t really give anything away. Camren Bicondova (Selina Kyle) revealed fours days ago she had been for her first costume fitting. It’s going to be very interesting to see how they progress with Selina’s style in the next season. Looks like there is going be a lot of 00Alfred action, Sean Pertwee ( Alfred Pennyworth) posted a superb photo of him reading his script on a rooftop with the caption underneath “ Gotham roof top action. Literally”. What will lead Alfred up on to those rooftops? There has also been a lot of visually beautiful photographs coming through which have been taken by Danny Cannon and Cinematographer Crescenzo Notarlie as they have been scouting locations. One of the images showed a room full of safety deposit boxes, so this might indicate a lot is going to happen in a bank in the opening episode. Crescenzo often posts fantastic images whilst they are filming Gotham, I highly recommend you follow him on twitter. Several casting calls outs have been posted on twitter. My favourite being a casting call for mental patients with crazy hair, gaunt faces etc. So if anyone would like to be in Arkham Asylum, now is your chance!